Wash drawing by Murugesa Moodaliar of a drum slab from the Great Stupa of Amaravati. 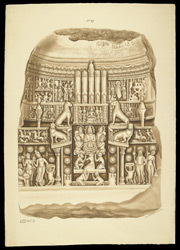 This is one of 42 sheets (89 drawings) depicting sculpture from Amaravati and S. India. Inscribed with numbers 2 to 90 (1 is missing) and with measurements; signed:' P. Mooroogasa Moodr', dated c.1853.